from 60 pcs. 0,74 EUR ea. from 140 pcs. 0,68 EUR ea. from 360 pcs. 0,62 EUR ea. A convenient solution if you would like to glue on a block magnet. 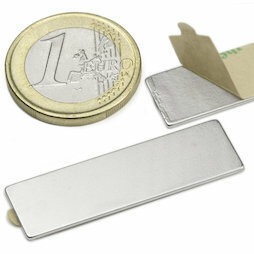 This is a very flat block magnet (40 mm long, 12 mm wide, 1 mm thin) with a self-adhesive side. Simply remove the foil, stick it on and your creative arts project is done. With a Q-40-12-01-STIC you can also organize various office utensils.